The boxer is an energetic, intelligent, athletic, and loyal dog breed. The boxer has a sweet and playful temperament that makes it an ideal companion. Boxers often get along very well with children and possess an instinct to protect the family, making them wonderful family dogs. It is well-known and the tenth most popular dog breed in the U.S. Weight: 55 to 70 pounds. Height: 1 foot, 9 inches to 2 feet, 1 inch at the shoulder. Coat and Color: Fawn and brindle are the standard colors, while all-white is typically not recognized by many kennel clubs. Standard markings include a black mask, black mask with white markings, and white markings. The coat is short. The ancestors of boxers can be traced back to a variety of dog breeds throughout Europe in the 16th century, but the breed was developed and perfected over the last several hundred years in Germany. Boxers are related to nearly all bulldog-type breeds. They were historically used for dog fighting but then developed into loyal, hard-working dogs. They were used as protectors, hunters, and even couriers. They were one of the first breeds employed as police dogs in Germany. Boxers began to gain popularity in the United States during the 1930s, though the breed was recognized by the AKC in 1904. The American Boxer Club (ABC) was formed in 1935. Today's boxers are known as loyal, playful companions, as well as excellent guard dogs. Boxers often have docked tails and cropped ears, but more boxer owners are leaving the ears uncropped. The happy boxer is an affectionate and loyal companion that would make a delightful addition to an active household. Despite their history of being used for dog fighting, boxers are typically gentle creatures without aggressive tendencies. They are known to get along well with children once trained and socialized. Boxers take a long time to mature and it may be three years before your boxer is no longer a puppy. They are generally housetrained between 4 and 7 months of age, but some take longer. Because boxers have very short hair coats, they have relatively simple grooming needs. Most boxers need occasional bathing and brushing. Although an active boxer may wear down its nails, keep an eye on them. Regular nail trims are important in order the keep their feet healthy and comfortable. Boxers are not very tolerant of either cold or hot weather and they are best suited to be a mostly-indoors house dog. Their short coat doesn't give them insulation against the cold. 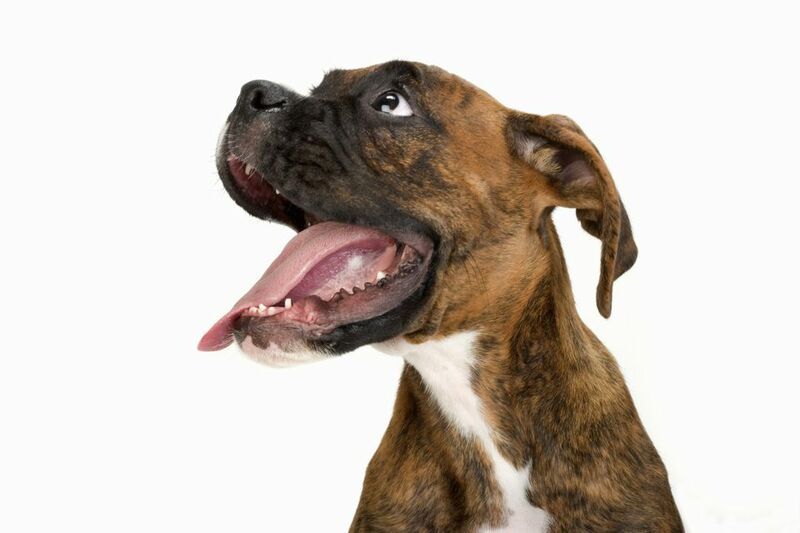 As a dog with a short nose, the boxer can't pant as well and so he can't cool himself off easily. It is best to keep boxers indoors during extreme weather, hot or cold. Exercise your boxer during the coolest part of the day in hot weather. Boxers can be hyperactive and unruly if not properly trained. This is simply a result of their big, loving personalities. Boxers love to jump up on people but can be taught to refrain from this. Don't forget socialization for your boxer; this is very important for all dogs. The high energy level and athletic physique of the boxer means the breed needs a significant amount of exercise every day. Make sure you provide the exercise needed to keep your boxer physically fit and mentally stimulated. Take your boxer for a 30-minute walk at least twice a day and play fetch or other active games. While not all boxers are droolers, some drool excessively. They have also been known to be snorers. Luckily, they are not known as diggers and most boxers don't bark except when appropriate. Responsible breeders strive to maintain the highest breed standards as established by kennel clubs like the American Kennel Club (AKC). Dogs bred by these standards are less likely to inherit health conditions. However, some hereditary health problems can occur in the breed. Remember that regular veterinary check-ups are an important part of keeping your dog healthy. Your vet may be able to detect the early signs of health problems before they affect your dog. Cancer: Boxers are prone to several types of cancer, including mast cell tumors, lymphoma, and skin cancer. Aortic stenosis: This is a narrowing of the aorta that causes the heart to work harder. It is a genetic condition and dogs with it should not be bred. It can cause fainting and sudden death. Dilated cardiomyopathy: This is also an inherited condition of an irregular heartbeat. Boxers with this condition should not be bred. The boxer may show fainting and sudden death. Deafness: This is associated with white coloring and may be seen in all-white or mostly-white boxers. Hip dysplasia: Boxers may have this inheritable condition that can cause pain, lameness, and arthritis. Breeders should provide proof that the parents have been tested. Your boxer will likely do best with two meals a day of 2 to 3 cups of high-quality dry dog food. As boxers have been known to have stomach torsion, you may want to provide a feeding station that is elevated so your dog doesn't have to bend down to eat. Providing two meals can help prevent eating too much or too fast, which can lead to stomach torsion. Monitor your dog's weight to ensure he isn't getting overweight. Your dog may need a change in diet as well as more exercise. You can discuss any special dietary issues with your veterinarian. As with any breed, if you think the boxer is the dog for you, do plenty of research before you get one. Talk to veterinarians, other boxer owners, reputable boxer breeders, and boxer rescue groups to learn more. There’s a whole world of dog breeds out there for you to browse.